This past week, on July 5 and 7, we upped the ante a bit in my work with Rocky. Part of it was planned, and part of it happened because of my own body. Let’s talk about the body part first, since that was the first to occur. On Tuesday, when I came to class, I wasn’t doing too well. We’ve had a run of quite a few days now with heat over 100 degrees, and extreme temperatures are one of the triggers for my episodes. I don’t always have full-on paralysis attacks. Sometimes what happens with prolonged exposure to triggers is that I have overall body weakness. I just get wobbly. I have a hard time walking in a straight line, and I need to rest a lot. When that is going on for me, I use a cane to help with balance and support. So on Tuesday, I used my cane in class with Rocky for the first time. Ripley is, of course, very used to my cane, since I use it almost every time we go out on errands. I bring it as a precaution, because even if I feel strong at the outset of a trip, something might come up while we’re in the middle of a store (fluorescent lights are a trigger) or while eating in a restaurant (certain foods are triggers, and I never know when they will affect me), and then I need support to be able to walk back out of the building. Or any number of other things. You get the idea. But Rocky had never seen the cane before during training, so I wasn’t sure how she would react. We used to have a little dog named Houla, and she was first adopted from a shelter to be a companion dog for Sabrina’s dad. He was elderly and used a cane. And it turned out she was terrified of canes, for some reason – something from her earlier life. So Sabrina ended up with Houla instead. Since Rocky is also a rescue dog, we really had no idea how she would react. Luckily, I had nothing to worry about. Rocky acted as if the cane had been there all along. We went through a usual class with no problems. In fact, the only issue we had at all that day was towards the end of the class, when we were working on straight line heels. With this command, I was supposed to give Rocky a heel command, walk three steps, then stop, and she was to sit at my side without being told. Initially she was doing great. Then she began doing all her sits backwards – facing Jared, the trainer! On Thursday, I returned, thankfully with a bit more pep, and Jared said it was time to advance to movement work. Up to this point, most of the training has been incremental; give a command, stop, next command. That’s important in the beginning, but Rocky has all of this down pat, and she is starting to get bored. Now it was time to put it all together into movement, so I spent almost the entire hour of training walking with Rocky heeling at my side. We walked in a circle around the training room, and Jared gave me these commands: circle right (turn in a tight circle towards the right and then keep walking in the same direction), circle left, and (drat! can’t remember the exact command! but — ) turn 180 degrees right and begin walking the opposite direction, or turn 180 degrees left and begin walking the opposite direction. Each time Jared gave one of these commands, I would say, “Rocky, heel.” At first, she bumped into me when I turned. But as the class progressed, she began to watch me, and pay attention to which way I was about to turn. Remember when I said in a previous post that Ripley never runs into me, no matter how erratically I walk? That’s what this is teaching. Training Rocky to look at me, focus on what I am doing, so when I change direction, she changes direction, too. Throughout these exercises, Jared would occasionally call out another command, such as “Sit” or “Down/Stay.” And wherever we were, we would execute that command. Then we would continue with the circle heeling exercise. Imagine that you’re in the grocery store, walking down an aisle, and you think, “Oh. Right! I need milk, too.” And you suddenly make a U-turn, to go back to another aisle. Or you walk into a restaurant, and find that there is a crowd of people, and you have to make an abrupt stop, and wait for a table. 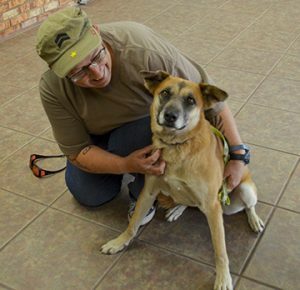 Your service dog needs to be able to react as quickly as you do, turning, stopping, sitting, waiting, then starting up again, without running into you or anyone else, without getting her leash tangled up, always paying attention. What was fun was seeing the progress – watching Rocky rise to the challenge, listen to my voice, catch my minor corrections, and by the end of the night, become focused on me with her full attention. We celebrated by collapsing on the floor when we were finished for a well-deserved selfie session, followed by kisses for Sabrina and Ripley. As much as I had been looking forward to my three-week trip to California, I also felt reluctant to go. It seemed I was just starting to make a connection with Rocky, and then I left. Would I have to start all over again? My first day back with her was on June 28. 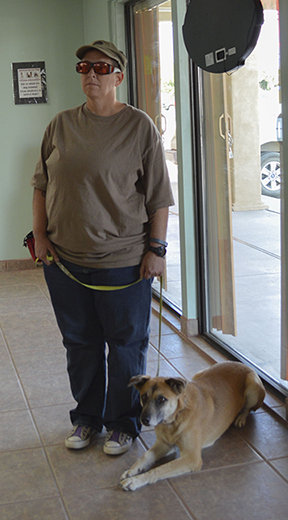 We were joined in class by the big Mastiff, Danu, and a new little herding dog named Fling, there for her first day of class. (It’s funny; training is just like going to a dog park. I’m learning the names of all the dogs, but not, so far, the names of the handlers. It’s impossible not to learn the dog names, as every command starts with the name: “Fling, sit.” “Danu, stay.” “Rocky, come.” You get the picture. We started off as always with sits, the most basic command, then worked on sit/stays and down/stays, now up to 10 seconds. Danu was having a “I don’t really want to pay attention to my handler” day, so Jared, our trainer, was assisting with some stern corrections. Add that to the fact that Rocky looked at Jared the entire time we were in the room, and I was getting a little frustrated. It was as if I wasn’t even at the other end of the leash. However, I knew this was mostly because I had been away, and she hadn’t seen me. It was a case of “Who are you again?” On top of that, I was feeling a bit “whooshy,” which is my short-hand way of saying I was weak and kind of on the edge of having a paralysis attack – which I did not want to happen. (Not that my preferences have ever mattered in the least.) To make matters worse, I had forgotten both my cane and my bottle of water. As we moved on to other commands, Jared had me take Rocky into the adjoining training room, so there would be fewer distractions. I worked on straight line heels, where I say, “Heel,” lead off with the left foot, step one step, then stop, and Rocky is supposed to sit at my side. We also practiced “Comes,” where I stand in front of her, step back to the end of a loose leash with her in a sit position, say her name to get her attention, and BEFORE she moves, say, “Come,” and she is supposed to come and sit at my feet. Rocky was doing great on these two exercises – except every time Jared would poke his head in the room, she would do her “sit” backwards, facing him instead of me. Gaw! Finally, it was the end of class, and we returned to the main room for our last exercise, the extended down/stay, where we stand next to our dogs for about 10 minutes. Sabrina looked at me and said, “Are you OK? Do you need a chair?”” I mumbled, “I’m fine.” The woman working with Fling said, “Are you just saying that?” To which I had to honestly answer, “Uh, yeah,” as I started to wobble. The kennel assistant, Laurie, and Sabrina both grabbed a chair and brought it to me. I guess it’s not as easy to hide what’s going on as I sometimes think. We increased our time on sit/stays and down/stays to one minute, and again worked on name/come commands and straight line heels. By the end of the class, I felt I had made that connection again, and Rocky was working beautifully with me. Jared said he would keep us in the Obedience One group for another week or two, then bump us up to Obedience Two. 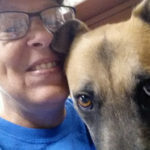 That means we’ll start moving out into the world, beginning our access training, getting used to people, elevators, electronic doors, cars – all those things a dog is not exposed to when training in a kennel. Even more importantly, Rocky will start coming home with me soon, first for overnight visits, then longer stays, and eventually for good. One of my favorite parts about these nights is this – whenever we enter the training room, Rocky runs up to give Ripley a nose kiss. Usually during the training session, I don’t use treats as a reward, except at the very end for new tasks. This drives Ripley crazy, because she is so food oriented. Why is that other dog getting little cookies? So as soon as we finish, I walk Rocky over to where Ripley is sitting, next to Sabrina, and give Ripley the “down” command, then reward her with a treat. Rocky always lies down, too, right next to Ripley. Double treat. That’s the way the evening ends – Rocky and Ripley side by side on Ripley’s blanket, with Rocky’s tail wagging madly. **If you are enjoying these posts about the adventures of Rocky and Ripley, I have a favor to ask of you. Please click on the Calendar/Date icon on the top of the page to open this individual post. Once you have done that, a number of options will appear at the bottom of the page. You can “like” the post, add a comment, check the box below the comment box that says, “Notify me of new posts by email,” or share this post with others via your favorite social media outlet – Facebook, Twitter, Google+, Pinterest, or email. Thanks so much for reading, and dog kisses from Rocky and Ripley! Through a misunderstanding, I arrived at class an hour early. It turned out to be a serendipitous mistake, as it allowed me to spend sixty minutes in a back room simply hanging out with Rocky, grooming her, stroking her, and playing; in other words, bonding in a way we haven’t been able to so far. I sat on the floor, with my legs apart in a vee. She would wander across the room, sniffing around. I called her name, and she would come running, landing in a heap in my lap, or sliding full body between my legs. Then she would just lie there, head over my thigh, luxuriating in the attention. She will blossom in our home, I am sure of it. She is so ready to be with a primary handler, away from the kennel. Ripley was a bit confused by me paying attention to Rocky, not sure what her role was. She wandered over periodically, checking in. I completely understand that she is trying to sort this out. Who is this interloper, taking up space in my lap? But there was no hostility or aggression. I tried to include her as much as I could, and she had her blanket, her “safe space,” to return to, when Rocky and I were involved with each other. Sabrina was also there to help out. There was a poodle in a kennel in the same room who barked much of the time which was annoying and gave Sabrina a headache so that wasn’t great, but otherwise – the hour was very good. Only one incident. Rocky kept licking one foot. She let me look at her other feet, was very good about letting me touch her body all over. But when I tried to examine the troublesome toe, at first she was OK, but then she got squirrelly, and wouldn’t let me see. Jared, the trainer, came into the room towards the end of the hour, and I asked him about it. He called Rocky over to the couch, and commanded her to give him the foot. She did. He looked at it, and said it was just a scab. But then I noticed she had peed on the floor. Clearly there are some fear issues here. She will do what he tells her to, but only because, at times, he demands it. Jared is a good trainer; but our styles are different. He sometimes uses a stronger approach than I feel is necessary, and I can tell already that Rocky is as sensitive as Ripley is. Strong is not needed. She will respond to a much lighter approach. One more reason that it will be good for us to have her out of the kennel soon, and in our home, so that I am her primary handler. I had to use to the bathroom before class, and I had Rocky, so I told Sabrina to take Ripley. That was weird for all concerned – for me, to be in a bathroom with another dog, and for Ripley, to let me disappear from her sight. Even in these smallest of things, there are going to be big adjustments for all of us. 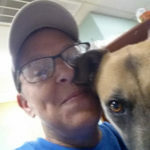 For our training session, we had two other female classmates, one with a big galoot of a Mastiff, and the other with a young mixed breed, lean but taller than Rocky. From the get-go, it was a difficult night. The Mastiff wasn’t cooperating, so Jared once or twice got his attention with a squirt of canned air, each time scaring the bejesus out of Rocky. After the first blast, Rocky kept trying to avoid Jared, and leave the room, which meant each time one of our exercises landed us near the doorway, she pulled in that direction. I was trying to pay attention to Rocky, knowing full well what was going on and what I needed to do, and trying desperately to get Rocky to focus on me. Argh! 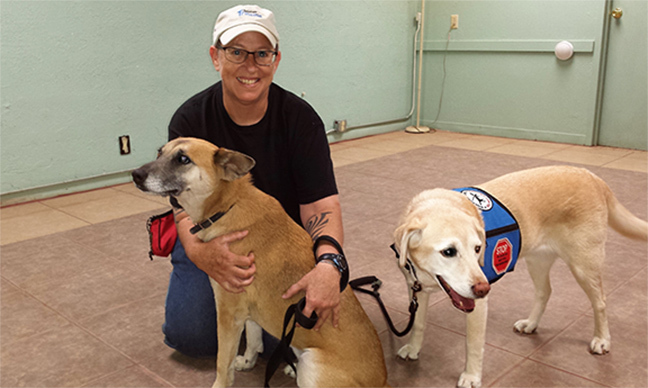 By the end of the class, Rocky finally did some really great, attentive “comes.” Jared was talking to me, as I listened out of the corner of my ear, saying, “Yes, good, big praise for that one.” At the the same moment, the kennel helper said, “Good girl, Rocky!” I had reached my limit. I turned to her and said, “It would be very helpful if you didn’t praise my dog when I am working with her.” She immediately apologized, and stopped her interruptions. And it was a hard day. But I left feeling hopeful, because Rocky and I had connected so strongly in play, and we had also persevered through the tough training situation, and had still managed to work as a team. I had a bit of an epiphany before arriving at our next day of training. 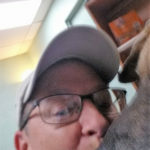 Because the training room has fluorescent lights, I have been wearing a special pair of tinted glasses over my regular glasses, designed to protect my eyes – one of the triggers for my episodes of paralysis is fluorescent lights. I realized, though, that one of the problems I seemed to be having was keeping Rocky’s attention, getting her to make eye contact. What if it was the glasses? What if she couldn’t “find” me behind those two pairs of lenses? So for our third day of training, I decided to risk the lights, and shuck the tinted glasses. Once again, Rocky and I were the solo team working with Jared Latham, head trainer, with Sabrina and Ripley looking on from the sidelines. Up to this point, Rocky has spent half the class looking at Jared. I have felt like a poor second, someone she is tolerating at the other end of the leash. But on this day, everything changed. We clicked. For the entire hour that we worked together, Rocky listened to my voice. She looked up at me at the end of every command. We were a team. We learned the four part correction sequence. Give a command. “Rocky, sit.” If she fails to respond, give a voice correction and repeat the command. “AHHT! Sit.” If she still fails to respond, give a leash correction, along with the voice correction and command. This means I am holding the leash loosely, so I now give a brief tug on the leash in the direction of the position I am asking for, and say, “Rocky, AHHT! Sit.” If even this fails to give the desired result, I move to the final step, which is to use my hand to place my dog in the correction position (using as little contact as possible), with the dog’s name and command. And always, after the dog has done what I have asked, respond with verbal and physical praise. Rocky, for the most. part, does not need correction. She knows all the commands, and knows how to follow them. The only reason she ever needs correction is because she gets bored; as in, “Really, do I have to do this again? I’d rather lie down now. I’m tired of sitting.” So that gave me a chance to practice the sequence, at least up to step three. Step four was never needed. After a few times of practice, the steps feel useful and practical. There is no manhandling, no jerking or tugging. Just clear, precise directions in those moments when my dog is not paying attention, and I need to bring her focus back to task. After the class, we had another breakthrough moment. Sabrina asked Jared about Malaki, our other dog, who tends to pull on the leash. Malaki can also be an escape artist; he has slipped out of a regular collar, so for a while, we used a harness. They discussed different types of collars, and Jared said one possibility was to combine a choke collar with a regular collar, in a manner which keeps the dog secure, without causing choking. He picked up a nearby choke collar and slipped it over Rocky’s head to demonstrate how the leash clips in. As Jared went to remove the collar, it caught on Rocky’s ears, and she cried out. He stopped, and tried again. She shrieked in pain, and it was clear that the collar was too tight, catching as it came over her head. Jared released the collar, and I realized he was going to wait until we left to deal with it. I didn’t want go knowing that my dog was in this situation. I got on the floor with Rocky, my knees on either side of her chest, and took the collar in my hands. Jared got down as well, to hold her; I believe he thought she might bite or snap out of fear. Gently, very gently, I brought it up on one side first, and worked it to the edge of one ear, lying the ear flat and then pushing it through until that side was free. Then I repeated the movements on the opposite side, and the chain slipped off over her head and nose into my hands. Rocky moved forward into my chest, and licked my hands and face. It wasn’t planned; it was only a few seconds. But in that moment, Rocky learned she can trust me. And that’s going to take us a long way. 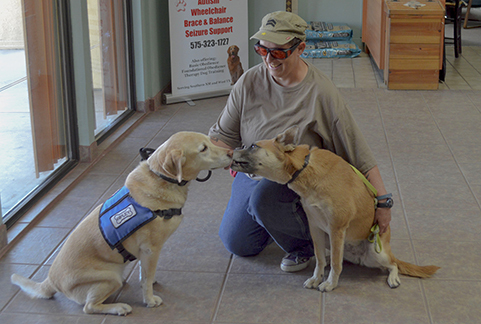 After our initial day of training, Rocky and I stepped into a much different arena for day two, as we were joined by classmates – two Rottweilers, one a seven-month-old wiggler, and the other full grown but still young. The young Rottweiler was working with a woman, and the older dog was being trained by a man. We worked in the front training area, which isn’t very large. The first challenge was simply trying to stay in our own space and out of each other’s way. The second was trying to deal with the cacophony of commands. 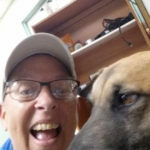 The man used a very large voice for all of his communication with his dog, and it was a bit like listening to a drill sergeant commanding an entire unit. Since my style is much softer, trying to create the cocoon in which Rocky and I could work proved somewhat difficult. But, I had to keep reminding myself, sometimes she will be in a situation with a lot of background noise, and she will still need to be able to shut that out and respond to me. So it’s actually a good thing to practice in all kinds of environments. 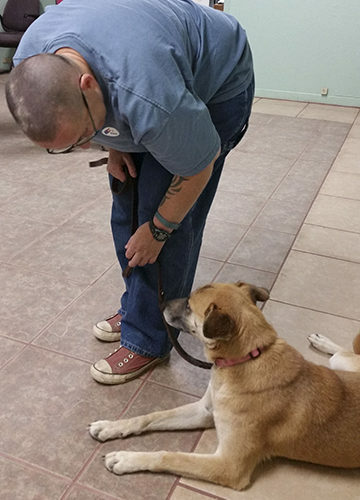 Rocky did well, and with the others in the class, I had less self-consciousness about giving commands, praising, and taking the beginning steps in this new relationship. 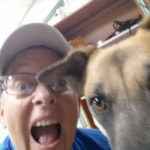 One of the things that we practiced this time that is very new for me is the use of the command “AAHT!” instead of “No!” Here’s the thinking behind this one, from kennel master Jared Latham. If you use the word “No,” dogs learn the word quickly as an indication of bad behavior, and your displeasure. The problem comes if you also use the word “no” in regular conversation. Let’s say you and your spouse are trying to decide where to go for dinner. “Do you want to have Thai food?” “No, not Thai food again! How about Chinese?” “Ack. No, no, no. You know they use MSG and I always get a migraine. What about Mexican?” So the dog is sitting there, hearing this chorus of “no,” wondering what in the world is going on. She either thinks she has done something wrong, or she begins to tunes it out, as the word slowly loses its impact. One more thing from tonight’s training. Ripley, as usual, was on the sidelines watching from her blanket. Jared used her as the “demo dog” for several things that we worked on tonight. She was somewhat reluctant to come to him each time, still looking at him with that, “Who the heck are you, and why are you asking me to do these things?” expression. But he was so sweet with her. As he leaned down to coax her over, he said, “Come on, mamacita.” It made my chest ache, hearing those words from him. My sweet mamacita. It’s real! 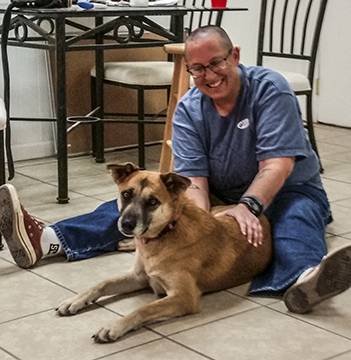 Rocky and I have started our official relationship, embarking on the first of ten sessions of basic obedience classes at American Service Dogs. OK, I should be clear here – it’s not Rocky that needs obedience training – it’s me. Rocky has already completed all of this work, and has even gone through most of the basic service dog training. I’m in catch-up mode. What needs to happen are two things: I must learn how she has been trained, so I can give the appropriate commands and signals she is used to, and we have to get used to each other, since at this point, we are for all intents and purposes strangers. 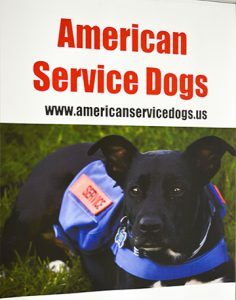 For the sake of convenience, from here on out I will refer to American Service Dogs as ASD, because I’ll be talking about the organization a lot, and three keystrokes is easier than nineteen. 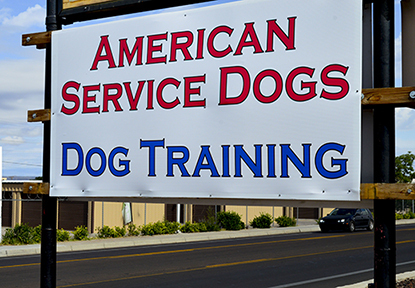 ASD offers classes in the morning and evening Tuesday through Friday, and in the morning on Saturday. You can sign up whenever it is convenient for you, and clients’ needs are met wherever they happen to be in the training process. What that means is that you never know who will be around on any given day. 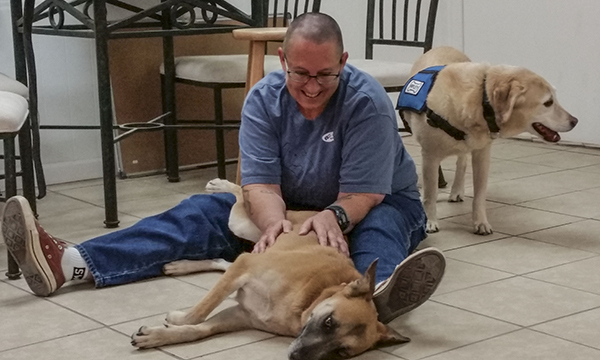 So for our first class, it happened to be just us – me and Rocky in the class with kennel master and lead trainer Jared Latham, and my wife Sabrina and soon-to-be-retired service dog Ripley on the sidelines. This was both great (tons of individual attention) and not so great (tons of individual attention). I loved having the opportunity to get all of that one-on-one time, but I also felt as if I was under a big spotlight, and it was hard not to feel self-conscious. We worked on the very basics: sit; sit/stay (working up to this through a four-step process, with tight leash stays, tight leash/loose leash stays, loose leash stays, and then stepping just in front of the dog for a brief stay); name with focused attention (calling the dog’s name when in sit, then rewarding her when she makes eye contact with you); and down. The hardest part about all of it was that as we went through the exercises, Rocky would, by default, look to Jared in between each set. She tended to walk towards him, make eye contact with him. She simply wasn’t focusing on me. Since the only other canine in the room was Ripley, Jared used her as an example dog. She was lying patiently, for the most part, on her blanket next to Sabrina. Jared would pick up her leash, and do a demonstration of each new exercise. Ripley seemed completely confused by all of this, with a look of “Who is this man asking me to perform commands?” She did, however, perform them, and gladly took the treats offered. A couple of times, she left her blanket, and wandered out onto the floor to come after me. I told her to return, and she did. However, it was clear she thought it all highly irregular. As I was trying to execute commands with Rocky, I became more and more aware that it has been ages since I have regularly used crisp, clear commands with Ripley. Yes, occasionally commands are called for. Sometimes I have to say, “Ripley, leave it!” or “Ripley, stay.” But most of the time, I embed my commands in sentences. I talk to her like she has a much greater understanding of the English language. “Ripley, let’s go get the mail.” “Ripley, fall back. Too narrow,” when I’m pushing a shopping cart, and we come to a tight squeeze. “Ripley, turn left here.” “Ripley, wait. I’ll be right back.” The thing is, she does whatever I request. The only way I can explain it is that she and I have been together so long; it’s a combination of her picking out certain words, reading my body language, and simply knowing what needs to be done next. Working with Rocky is making me hyper-aware that I need to pay attention to what I am saying and doing. Four steps – Rocky’s name, the command, the praise and (sometimes) treat, and then the release. New habits, so she knows what the hell I want from her. And getting over the self-consciousness, because this is about me and Rocky. Who else am I trying to impress? Oh – and best part of the class? At the end, Rocky came over to say hi to Ripley, and gave her several sweet kisses. This is all going to work out. 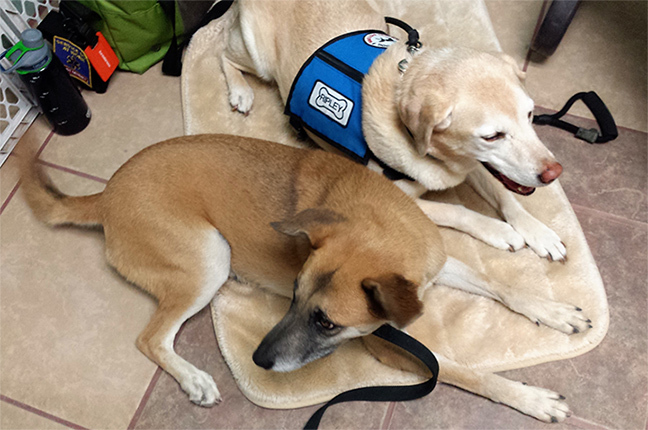 Rocky, the two-year-old female who will most likely be my next service dog, had a big week. She not only met me, Ripley, and my wife Sabrina – she also met, we’re pretty sure, her very first cat. 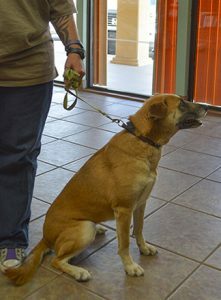 Rocky is, by our best guess, a Belgian Shepherd Malinois mix. We went to see her on Tuesday for the first time – we being Ripley, me and Sabrina. I knew that Ripley would be fine. As long as the other dog is not aggressive in any way, we never have any issues. Ripley gets along with everybody. She did a little meet and greet, and then that was it. No big deal. 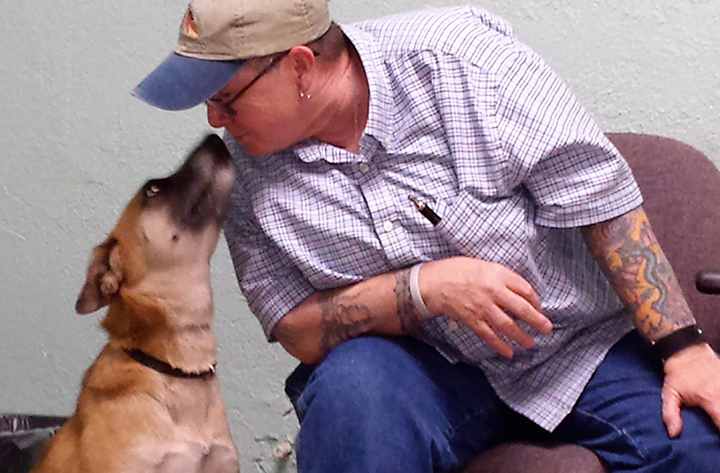 Rocky was very friendly with me, approaching repeatedly, and generous with gentle kisses. It was nice to have kisses. She has a soft mouth, and a fairly submissive demeanor. I got no hit that she would try to be the alpha in the household, which is good. We decided to come back the next day with Malaki, our pit cross, since he can be somewhat nervous with new additions to the family. 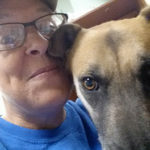 We also had no idea if Rocky had ever encountered a cat, and because we have four cats at home of our own, plus a roomful of kittens who Sabrina is fostering for a local rescue program, we wanted to ensure that any potential service dog didn’t have major cat issues. So, on Wednesday we loaded up our truck again, this time with Ripley, Malaki, and Dozer. Dozer is our most mellow cat. Part Siamese, he’s the kind of guy you can toss in the air and catch on the way down, a cat you can literally flip over on his back on the bed to rub his belly, and he purrs all the way through it. We figured if anybody could handle the situation, it would be Dozer. Malaki tested first. We kept him on a leash, with Rocky and Ripley loose in the room, along with about five people. 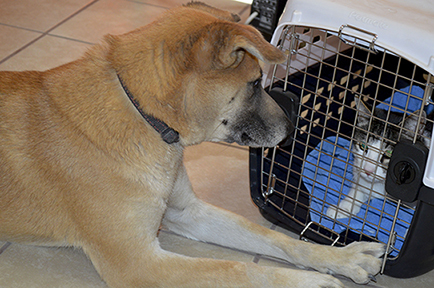 Malaki was alert but OK – until Rocky came up and licked his nose. Then Malaki growled and snapped. Rocky immediately backed up, then kept her distance. 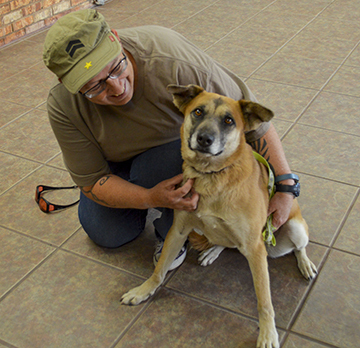 As Jared Latham, head trainer at American Service Dogs said, “Well, now we know what Malaki doesn’t like. That’s the only way dogs have to communicate. It may not be the best way, always, but it’s the only way they have.” We let the dogs be in each other’s presence a while longer, and it was clear from that point that it was going to be a workable situation. Malaki established a boundary, Rocky respected it, and that was that. Now for that cat. Rocky hadn’t noticed Dozer at first. Jared brought her over to the crate that Dozer was in, on the floor. Whoa! Immediate interest! As you can see in the photographs, Rocky was intensely fascinated with the cat. She stretched out on the floor and just stared at him. Dozer couldn’t care less. He was completely unintimidated. He’s grown up around dogs, and has no fear. So they touched noses through the door, and had a good sniff. 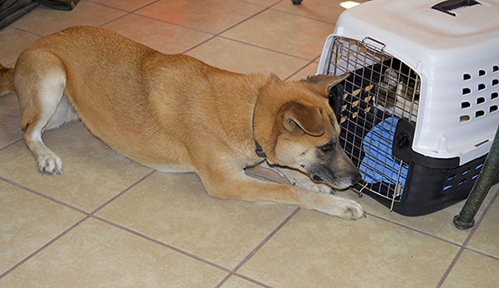 We opened the crate door – and Rocky tried to crawl inside with Dozer! It was hysterical. There was no maliciousness; she just wanted in there to see what the heck was going on. Jared pulled her back out, and we allowed space for Dozer to exit. As we all watched, Dozer nonchalantly began to walk the perimeter of the room. Rocky did a GI Jane crouch-crawl, in pursuit. As Dozer made a little headway, Rocky sprang up and trotted after. She began to bounce up and down, complete play behavior, an invitation: “Come on! Let’s go!” Dozer ignored her, and kept walking around the room. He went to the opposite corner, and jumped on top of some wire kennels, and Rocky nearly died of excitement. This was fun! Then Dozer disappeared behind the couch. The dog ran all the way behind the couch, and found no cat. That was simply too much for Rocky. A game of hide-and-seek where the cat actually vanished? She became a bit obsessed, and had to be escorted from the room. Jared and Sabrina had to tip the couch over to find Dozer, who had gone inside – it was a sofa bed, it turned out, so had a “secret” compartment. Still, Dozer was completely unruffled, and walked calmly back to his crate. We’re thinking we should have brought Bailey, who maybe would have taken a swat at Rocky, and given her more of a sense of real cat behavior. She’ll learn.